The Russian bond market, which offers better yields compared to Europe and the United States, is now completely open to foreign investors. Following the introduction of simpler procedures for bond trading via the Euroclear and Clearstream depositories, foreign investors now have direct access to the domestic Russian bond market. Beginning Jan. 30, customers of the two depositories can buy Russian corporate and municipal bonds without having to set up Russian subsidiaries or opening special accounts with Russian banks. Before the new procedures were introduced, foreign investors only had indirect access to the Russian bond market. For example, Clearstream allowed its customers to buy Russian bonds using a Deutsche Bank subsidiary in Russia as an intermediary. The entry of Euroclear and Clearstream to the Russian market for corporate and municipal bonds signals a new stage in the integration of Russia's post-trading infrastructure into the global market. The first stage took place in February-March 2013, when international depositories were allowed to offer their customers off-exchange deals with Russian federal bonds. 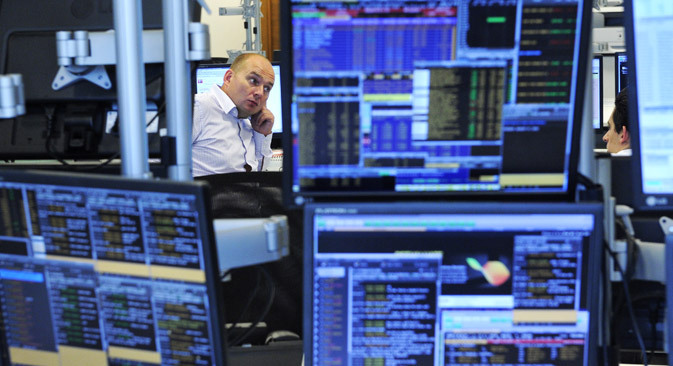 On July 1, 2014 Euroclear and Clearstream will also be allowed access to the Russian stock market. Clearstream and Euroclear control over 70 percent of the European off-exchange trade in securities. The main role of these two international central depositories is to facilitate cash payments on a global scale. Gaining access to cheaper credit is the main benefit to Russia from opening up its bond market to foreign investors. The more buyers are allowed to purchase Russian bonds, the lower the interest paid by the bond issuers. The advantage for foreign investors is the relatively high yields on Russian bonds. The government hopes the new measure will attract an additional $10 billion or more to the Russian bond market via the international depositories. As a result of the changes, international investors’ share of the Russian corporate bonds market could triple to 10 percent over the next two or three years - an increase of $10-15 billion in absolute terms - according to a forecast by Russian Foreign Minister Anton Siluanov. As for corporate bonds, foreign investors have now been given access to securities traded on the Moscow Exchange. These securities include bonds issued by such leading Russian banks and corporations as Sberbank, Gazprom, and Rosneft. The yields on these papers can reach 7-8 percent, significantly higher than in Europe or the United States. Foreign investors may be interested in higher-yield and higher-risk bonds, such as the ones issued by Mechel or RUSAL Bratsk, or virtually risk-free bonds, such as the Gazprom and Sberbank papers. A bond is a type of debt security under which the buyer receives a fixed amount of interest, along with the principal sum, at a pre-determined maturity date. For example, under the terms of the municipal bonds issued by the city of Volgograd, the city undertakes to buy back its own bonds in three years’ time at a fixed price, which is obviously higher than the initial price at which the bonds were sold. Investors can also make money on the fluctuations of the current bond prices, since these papers are bought and sold on the open market on a daily basis. “Given the existing Russian practice of inter-budget transfers, municipal bonds can be viewed as an equivalent of risk-free federal government bonds, but with much higher yields,” said Timur Nigmatullin, an analyst with the Investcafe consultancy. “For example, yields on the federal papers maturing in June 2017 currently stand at 7.2 percent, whereas the figure for the Voronezh Region bonds maturing in December 2017 is 8.4 percent." Municipal bonds are one of the smallest of all the Russian bond markets, accounting for only about 3.5 percent of the total. Foreign investors may be interested in bonds issued by big Russian cities, which have a relatively high credit rating. The Moscow city bonds are especially popular among investors. Vadim Vedernikov, deputy head of the analysis and risk management department at UFS Investment Company, agreed that Russian bond could be interesting for foreign investors. “Yields depend on the level of risks for each individual issuer,” said Vedernikov “But on the whole, the baseline yield level for Russian municipal and corporate bonds by issuers with a BBB rating is 7.5-8.5 per cent. For papers with a BB rating and below, yields lie in the range of 8-14 per cent." He added that the main potential deterrent for foreign investors is the limited liquidity of Russian corporate and municipal bonds. The advantages of using international depositories include a high level of protection from infrastructure risks, and transparency of the trading process.